Blog Is Your Money Mindset Affecting Your Bank Balance? Today we're going to talk about whether you can improve your financial situation simply by reframing your thoughts and beliefs about money. Is your money mindset negatively impacting your finances? You can WATCH or READ this post, your choice! What is a mindset anyway? You have a 'mindset' about lots of different things and it tends to be skewed over to the positive, the negative or maybe it’s even neutral. For example, you might have a really positive mindset about your job, so when you head in to your job each day, you’re feeli​ng good. So you turn up feeling good and that causes you to act in a certain way, which leads to the results that you get on a daily basis. Whereas if you have perhaps a negative mindset about your job, that’s going to cause you to feel certain ways about your job. You’re going to turn up to work feeling like that, and you’ll start acting based on how you feel. Which is in turn, going to lead to the results that you get! So, having a positive, or a negative mindset really does have a direct impact on the results that you get. It’s a cycle. Having a positive money mindset is going to influence the results of your financial goals. Your thoughts cause the feelings that you have. Your feelings cause the actions that you take. The actions that you take generate the results that you get. But here’s the thing. Once you’ve gotten those results it just reinforces the thoughts that you had in the first instance! You just (well you think you just) proved to yourself that your thoughts and beliefs are correct. Download the Belief Reframing Workbook, and try out this technique for yourself. Yes, please send me the workbook, and email newsletters from The Leveraged Mama. That’s how our brains work! This is called the confirmation bias. In a nutshell, this psychological bias causes us to seek out evidence that our beliefs are true - and once we find that evidence, we STOP looking for evidence to the contrary. That kind of explains why people can hold such strong beliefs about a given subject, and simply won’t entertain contrary beliefs (um, religion, politics...). So I reckon, if you’re going to set about proving to yourself that your beliefs are correct, it could be a good opportunity to first QUESTION those beliefs. Question those thoughts, and try to reframe them, if they’re not serving you well. Because if there’s an opportunity to reframe at the beginning of that cycle, then slowly, bit by bit, you can positively reinforce the cycle and actually change the results that you're getting. Yes, I know what you're thinking, you have to be prepared to take a bit of a risk here, because it’s a chicken and egg situation. You will first need to change the belief, the very belief has been previously ‘proven’, because of the results you’ve been getting. That's the risk you're choosing to take. But by doing this, you're going to start that cycle off in a slightly different way, and eventually you’ll start getting better results. Now to be clear, I’m not talking about “just think about something enough and it will fall out of the sky into your lap.” That’s not what I’m talking about, let's go back to that whole cycle of thoughts to feelings to actions to results. Your thoughts are influencing how you feel, how you feel causes you to act in a certain way, which generates the results you are getting. I can’t reiterate that enough. So that’s why I’m saying it isn’t magic, it’s just about using your mind to reframe your life. Your thoughts - your perception - is your reality. Like, if you’re led to believe or believe for whatever reason that you are a poor sports person - say, noone in your family is good at sports so you don’t believe that it’s going to happen for you either. You might not have a god-given gift of athleticism and speed, or your genetics don’t give you an obvious edge. All of this evidence you have found, to support your belief. Do you think that you will just become a great sportsperson despite that? If that’s you believe from the beginning, then why would you ever become a great sportsperson? If you instead choose to believe, “You know what? I am actually really good at table tennis.” Fake it til you make it. Then there is a possibility that you could become very good at table tennis, because it started with that belief. But it’s never going to happen if you don’t start with the belief. Everything starts as a thought and as a belief. Think about the last big goal that you achieved. It didn’t just happen, did it? Goals don’t just happen, you don’t just look around and go “daaaamn I just did that”. You think about it first. You think to yourself “I would really love to be able to do this” or “I’m going to do this!”. Then you set about achieving your goal. But it all began with that thought and that desire to achieve something. It didn’t just happen. If you never thought about it is it likely to have happened? Probably not. Another point I want to make is that I’m not saying I want you to be delusional. There are some things that may never happen and maybe it’s futile to believe they’ll happen in the first place. You know, you’re not going to say to yourself “I’m going to move to Mars damn it, because I believe it.” You’re not going to do that! But try it for yourself, try reframing your thoughts and beliefs about something and see what happens. If you’re having trouble with your job for example - in the morning, get up, do a morning mindset journal. Write about things you want to get out of the day and how you want to act while you’re at work. Write about how you want to feel by the end of the day. Write down exactly how you expect to feel, if the day was a success. You’re framing things in a positive manner, so that you feel better about the situation, and are more likely to take the actions that are required, to generate better results. Okay let's try some examples so that you can see how to change limiting beliefs about money. Let's start with the example of the thought - remember, the thought, or belief, begins the cycle. Thoughts to feelings to actions to results reinforces the thoughts and beliefs. Let’s start with the thought ‘I can’t afford to do that’. So that’s your thought, it’s also your belief. You believe, to the best of your knowledge, that you can’t afford to do something. The feelings that’s going to generate, well it’s probably not going to be so good. You’re probably going to feel a bit disempowered. A bit negative. Despairing even, depending on what you think you can’t afford. The actions that are going to come out of that - well, you’re not going to pay for that thing that you think you can’t afford! And that’s the end of the story. Done, your action is, you’re just not going to pay for it! So the results that you get are that maybe you don’t get what you really need. And that reinforces your belief - your belief that you can’t afford something, that you can’t afford to pay for what you really need. It’s just the way it is. It’s very fixed, it’s not a good situation to be in. What if instead, we flip that on it’s head and you think “Well, I can afford anything actually, I just can’t afford everything.” Isn’t that actually true? So you feel a little more positively about this, a bit happier, a bit more empowered. You can solve it! You’re in that mindset you can solve this problem. You feel more positive about everything. So you find a way, you make it happen and you get what you need. And that reinforces the thoughts and beliefs that you had at the beginning that you can afford anything. Because you’ve just proven it to yourself. So that’s pretty cool, isn’t it. You started with a thought, one on the slightly negative side and the other on the positive side and the outcomes were different. 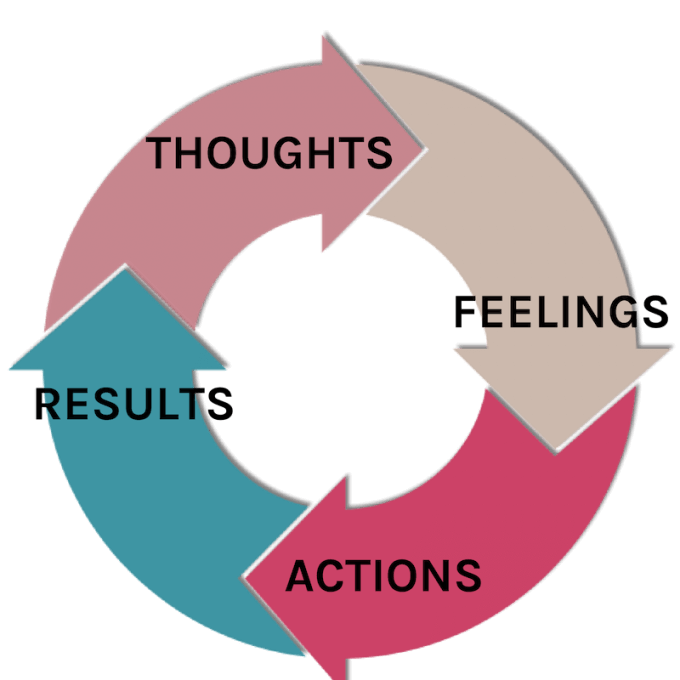 That thought or that belief that you begin with, begins that cycle. Alright here’s another example. Let’s say you have the thought, the belief that you don’t deserve to be paid more for what you do. So the feelings that’s going to generate are not so good, again. You have a feeling of resignation, that ‘this is just how it is in this industry’. You feel that’s just how it’s going to be. What actions are you going to take if you have that belief already that you don’t deserve to be paid more? Probably, nothing! You’ll continue to just accept what you’re given, and ask for no more. Your actions are a direct result of the feelings generated by the thoughts that you had in the beginning. You don’t deserve to be paid more for what you do. And what are the results likely to be? Well your clients will continue to pay you the same amount - have you ever had a client say “charge me twice as much!”? Of course not. Even if you’re undercharging - particularly if you’re undercharging - they’ll probably keep quiet! So this just reinforces the belief you have, that you don’t deserve to be paid more. How is that thought, that belief going to make you feel? It’s going to make you feel positive, deserving, and probably in a more positive, action taking mood. So the actions that you take - well you decide to put your rates up, you prepare to have conversations with your clients. Maybe you decide to take a course on how to price your services properly. And what are the results? You’re going to get paid more, or lose the clients that don’t hold the same beliefs as you (which is fine!). So the results are, that you end up with clients that agree that you should be paid more for what you do. In fact, you attract more of them. And this reinforces the belief that you should be paid more for what you do. One more example for the road, although I’m pretty sure you’re getting this concept now. In this example, the belief is “I’m a spender, not a saver.” That’s your thought, your belief. Maybe you’ve done one of those money personality tests, and the outcome was that you’re a spender. You feel a bit resigned to that, but at least you have confirmation of why you’re always broke haha. Because the way we work is that we act out our beliefs. You’re not going to act in contrary to what you believe. So you’re just not going to become a saver, if you believe you’re a spender. And the results you got (you spend more money) - reinforced the belief that you had about yourself, that you’re a spender. So of course you're thinking - how do I change my mindset from spending money to saving money? Well, what if you decided, one morning when you were journalling, “Hey, today I’m not a spender, I'm a saver. That is who I want to be today and how I want to act. I’m a saver”. You feel pretty positive about that. Because you will be saving more money. You’re in the mindset of being a saver and you feel good, because that feels like a really good thing for your future. The actions you take because of that reframed belief, is that you spend less money, and save more money! And you do it, to reinforce the belief you have about yourself. To prove to yourself that you are correct. “I’m not a spender, I’m a saver! I’ve got a lot of money here!” It’s at the front of your mind and you are wanting to reinforce that belief. Your money beliefs are so important. So around and around that goes and eventually you just become that belief. So again, do you want to choose the negative belief or the positive belief, given that it all starts with a belief. What do you think, can you improve your financial situation using your thoughts and beliefs? It sounds crazy but it’s totally not. It’s all about how the mind works and all we’re doing here is using it in the best way to get the best results. We know that we all act in ways to reinforce the beliefs we have. We know this, so why don’t we chuck in a belief that’s going to positively impact on our lives and then see what happens. Don’t worry, if this has kind of made you think ‘Do I have a poor money mindset?’ or ‘My mindset is making me poor what do I do now??’. Don’t freak out about that. I have something to help you with that! I will be the first to admit that I used to have a bit of a lack mindset, a scarcity mindset, and the results I was getting were as a result of that, which just reinforced my belief that was never enough money. Now that I have a more abundant mindset, I see things differently. I see things a lot differently. I believe many different things than I used to believe. For example, I just decided one day to believe that I would have a multi-six-figure online business very soon. A business that I could run from home, or anywhere (read between the lines - Bali or Hawaii haha). A business that I could maybe work 20 hours a week max. So with that belief in mind, how do you think that made me feel? Oh yeah, pretty good! I will also admit, that in the beginning, when I first started framing that belief, I wasn’t a believer and I could see that, and I could tell that. So I did a lot of work on reinforcing that belief, to make it more real, to make it more believable to me. It didn’t take long but I’m a believer now! I will be a multi-six-figure online business owner very soon. And you better believe I’m acting in a way to make that happen. All the things I do for my business are aimed at creating a multi-six-figure online business. There is no way that a multi-six-figure online business would just fall into my lap, without me believing that it’s going to happen in the first place. There’s just no way, I mean who gets that lucky. The things that I’ve had to learn, that I need to understand about business to be able to make this happen… You know, this isn’t The Matrix, I can’t just download that information into my brain. So these are the sorts of actions I’m taking towards making that belief a reality. I’m acting out that belief. So for me, right now, I’m believing that’s true and therefore I’m acting that out. The results are going to come and I am very believing in that. And I can’t wait for when they do because not only will it be a total reinforcement of my belief, but I can also show you just how powerful this technique is. What are some ways to improve your money mindset? On a smaller scale, I want you to know that it is relatively easy to improve your mindset. I’ve just created a 15 minute video training just for you with some really simple tips for improving your money mindset. What you’ll get is a free 15 minute video training, where I walk you through 10 steps you could take today to boost your money mindset. Some of them are instant and immediate, some of them take a little bit longer. There are 10 actions that you can pick and choose from, to start improving your money mindset today (and therefore, your bank balance!). You don’t need to know if your mindset leans more towards abundance or scarcity, but you’re going to figure it out pretty quickly, whether you have a bit of work to do or not! You’ll also know immediately which ones you can implement today. This training is directly related to improving your money mindset, so that you can improve your financial situation - because you better believe that there’s a connection between the two! Having a good money mindset affects your bank account balance - absolutely. So if you enjoyed this and want to take some action today, go and check out the free training. But also I want you to know that this is a journey, and you never just get to some place and stay there and say yeah, cool I’ve made it. It’s a journey and your path will change along the way. Sometimes you veer off the path, that’s okay - you can come back on the path, and maybe it’s a different path. It’s a journey and once you get there you’ll probably decide you want to go somewhere else. I’m here to help guide you along the way, to make it a positive journey, and make it a shorter and more enjoyable journey to your money goals! Be sure to download the worksheet that accompanies this episode, and have a go at reframing a belief that you have, that may not be serving you any more! Hit me up if you have any questions or need some help! Did you have any major a-ha moments today that you want to share with me? Drop me a comment! I love everything about this! It’s all about the growth mindset (temporary situation) versus a fixed mindset (I’m stuck like this forever). Definitely feeling motivated to continue toward my goals!